Hey everyone! So here it is, the cover to my (and Conrad Teves’) upcoming comic, HOLLOW’S PRISM: Issue #1 “Aftermath”! 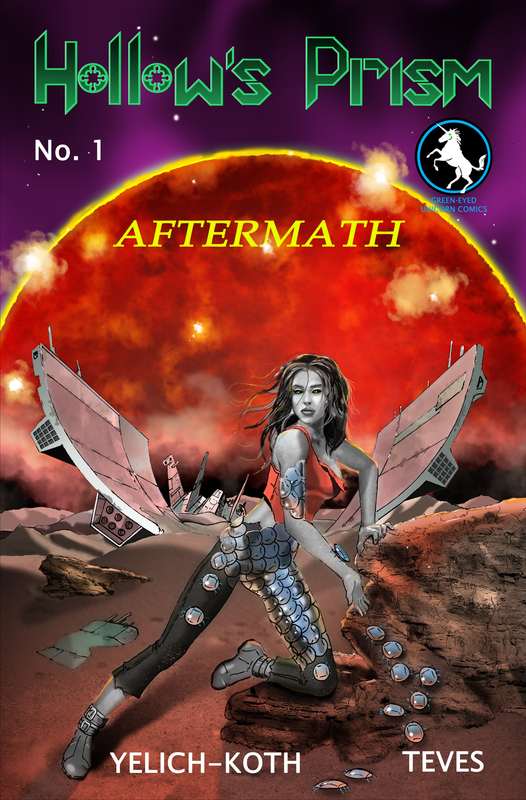 Thenn has spent 5 years fighting the tyrannical Chears, only to be mutinied by the crew she trusted, and left for dead on a waste-covered planet. Without food or water, Thenn has no hope to survive, and knows she will die–forgotten and alone. PS- Don’t forget! All proceeds during August from any of my song purchases (“Fairy Tales,” “Silly Me,” and “The Road” under the name RENEE KOLE) will go toward printing costs of “Aftermath!” So if you like the music or know someone who would, please download now at http://www.cdbaby.com/Artist/ReneeKole or iTunes or SHARE THIS POST. Thanks everyone for all your help so far! I am about 25% of the way to my goal with a little over two weeks left!! We can do this!! I like it! The woman looks a bit like you which is cool. It definitely got me curious about what events led to the scenario depicted, which I figure means it is doing its job. And I agree with your dad, the teaser is great too. Thanks! Yeah, I’m starting to hear more and more that she looks like me, but I swear she’s not! Haha! And curious about how she got that way is VERY good! Looks good. You’ve added one more reason for me to look forward to the fall. the cover is brilliant, as usual. can’t wait to get this one. i’m looking forward to having an entire ‘hollow’ collection! « Fundraising with my music! !